A New Orleans native, DJ Eydie May has enjoyed listening to WMPG’s eclectic programming since making her move to Maine. 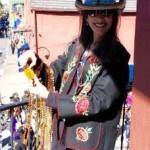 In her show, The Lagniappe Show, she plays tunes from her favorite New Orleans artists. DJ Eydie May is delighted to have the opportunity to bring the rhythms of the Crescent City to the Casco Bay City.